Trying to think of creative Halloween decorations, but not having any luck? 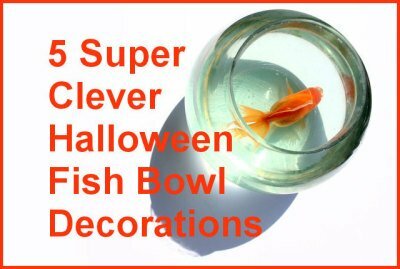 These 5 clever Halloween fish bowls might spark some inspiration! This creepy and creative Halloween fish bowl features an unearthly skeleton cat reaching into a fish bowl to catch an unknowing skeleton fish. 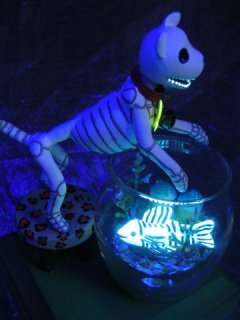 The entire piece sits under a blacklight, creating even more of a Halloween ambience, with a glowing fish which lights up the entire piece and creates a point of interest. Looking at it, I can't help but wonder "what's going to happen next?" This art piece was constructed with clay figures, some black light paint, a standard fish bowl, super clever props, and lots of creative prowess. This piece was created by Tamra Kohl. For more examples of her work, try visiting her blog Clay Lindo. This cool Halloween fish bowl can be completed with some red, non-toxic, 3-dimensional paint. 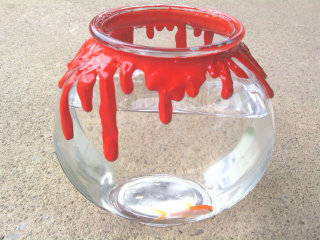 The paint is used to create a blood dripping effect from the rim of the fish bowl. Once it dries, it looks shiny and wet to create the effect of illusion of fresh drops. Complete the bowl with some black pebbles at the bottom, and some creative halloween props. This creepy fish bowl was inspired from Etsy. This cute Halloween themed fish bowl is made complete with some orange and black glass paint, chenelle stems, some jack-o-lantern jingle bells, and a standard 6" tall fish bowl. The polka dots can be added with a flat pencil eraser, and the chenelle length can be created by wrapping the chenelle stem around a pencil, varying the colors. Once done with your new chenelle decoration, you can attach the jingle bells, and wrap it around the fish bowl for a great halloween craft. 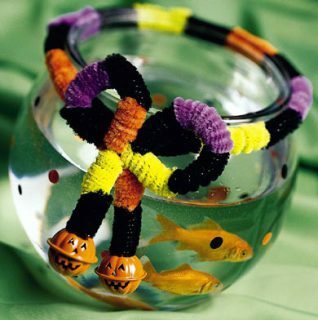 This cute Halloween fish bowl decoration was inspired from Better Homes and Gardens. 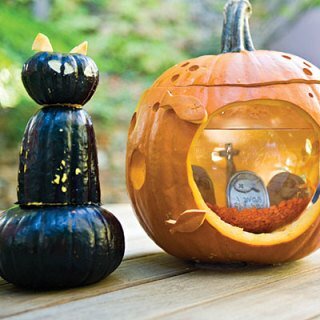 This super creative pumpkin fishbowl was made with a pumpkin and some acrylic glass to create a window. The artist used hot glue to attach the window to an acrylic mold inside the shark teeth. Afterwards, he painted the pumpkin, attached eyes, and put together some creative props to decorate the inside. The end result is a fish swimming around in a shark mouth, with skeletons no less. A great creepy Halloween decoration. 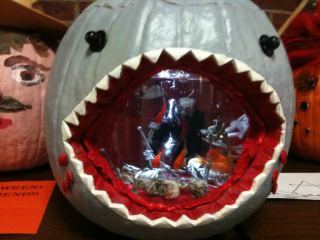 This creative Halloween fish bowl was created by MattNano. This fishy Halloween pumpkin can be created by tucking a fitting fish bowl into a hollow pumpkin. The pumpkin can be carved in any creative way you'd like, and the inside can be decorated with creepy props. You can use orange or black pebbles to decorate the bottom of the fish bowl, along with some gravestones, skeletons, or whatever else you can think of to decorate the inside. Fishy Halloween pumpkin inspired from Southern Living. Feeling inspired to create your own Halloween fish bowl? If so, remember not to put anything toxic in the water, and to take proper care of your fiendish fish. How To Meet A Girl: The Animal Video Of The Day!! !